Create a Workflow in AEM is the basic requirement which is expected now a days from a AEM Developer. It is quite simple to create a workflow in AEM and most of us are notl able to answer questions on it because we never got an opportunity to work on it or explore AEM workflow models. Basics of AEM Workflow Model. 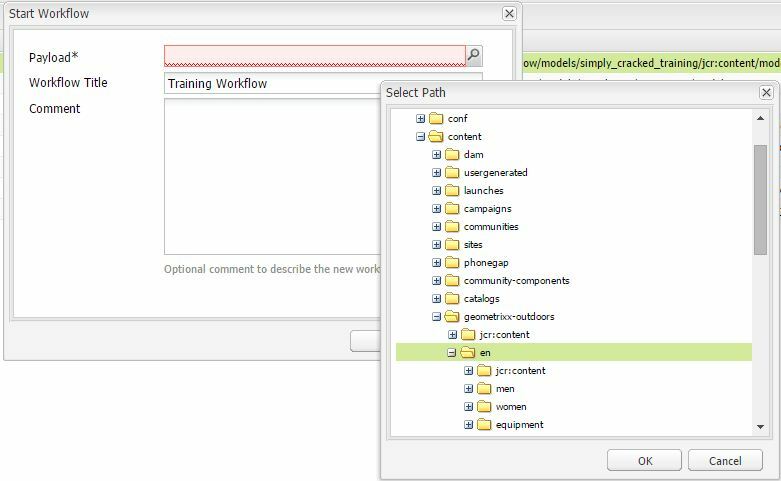 How to create a Workflow Model in AEM. How to add a step to Workflow Model in AEM. How to edit a Workflow Step in AEM. How to Start Workflow in AEM or Test Workflow in AEM. Creating a workflow allows user to define and execute a series of steps. In AEM we call workflow as Workflow models .Below are the basic terms used in aem workflow model. Model : It is made up of WorkflowNodes and WorkflowTransitions. Workflow models are versioned. Running Workflow Instances keep the initial workflow model version that is set when the workflow is started. Participant (User/Group): These types of steps generate a work item and assigns it to a user or group. A user must complete the work item to advance the workflow. Process (Script, Java method call): This type of step is executed automatically by the system. An ECMA script or Java class implements the step. Container (Sub Workflow): This step starts another workflow model. OR Split/Join: Uses logic to decide which step to execute next in the workflow. AND Split/Join: Executes multiple steps simultaneously. Transition : Defines the link between two consecutive steps. WorkItem : A workflow instance can have one or many WorkItems at the same time (depending on the workflow model). Payload : References the resource that has to be advanced through a workflow. The payload implementation references a resource in the repository (by either a path or an UUID) or a resource by a URL or by a serialized java object. Referencing a resource in the repository is very flexible and in conjunction with sling very productive: for example the referenced node could be rendered as a form. Lifecycle : It is created when a new workflow is started and ends when the end node is processed. Inbox : Each logged in user has its own workflow inbox in which the assigned WorkItems are accessible. Launcher : Allows you to define a workflow to be launched if a specific node has been updated. When we create a new workflow model it consist of three default steps Flow Start ,Flow End and a dummy participant step named as step 1. Flow Start and Flow End represent start and end of workflow. 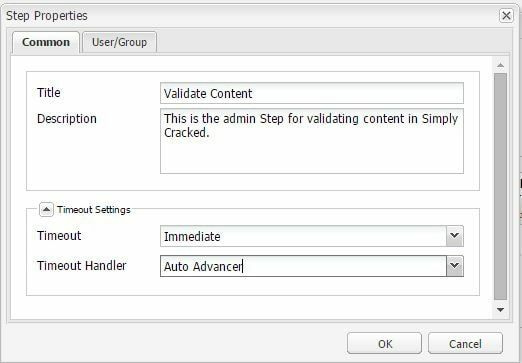 Step1 Participant Step is assigned to admin user to configure a work step. We can edit or delete this step and add new steps as required. Select Models tab –> Click New. 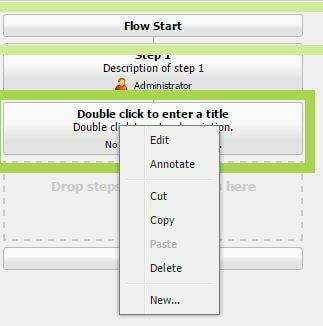 The New Workflow dialog will open –> Type the Title and Name for your workflow and click OK. Your new workflow model appears in model tab. Note: Its a good practice to keep Name field in lowercase. As it acts as an id and doesnot accept space between words. Title acts as display name. Steps are used to represent an activity to be performed in Workflow. AEM comes with several pre-installed steps. When we open the workflow in edit mode, you can see all available processes that can be added to any step in workflow model. Go to Model tab of workflow console. Either select workflow model right click on it and click edit or double click on selected workflow model. Drag a workflow model step from the sidekick and drop on indicated area as shown in below figure. A green check mark icon on the workflow component indicates its a valid drop zone. Note: Workflow steps always execute in the order in which they appear in workflow model. For editing a workflow step we can either use the default step1 or we can create a new one. In this example we are going to use the new participant step that we have created above . Right click and delete the default Step 1. Right-click the participant step and click Edit. Enter the values for Title and Description and Enter timeout setting as immediate and handler as Auto Advancer to move to next step. For example Validate Content. 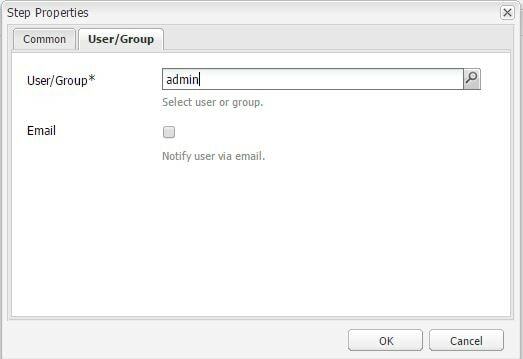 Set the User/Group to admin, it will show you a drop down list of valid users and groups and click OK. Drag an Or Split onto the workflow available above participant step in sidekick and position it between Validate Content workflow step and Flow End step. Right-click the Or Split step and click Edit. We can choose only one default route. For Branch 1, select Default Route. 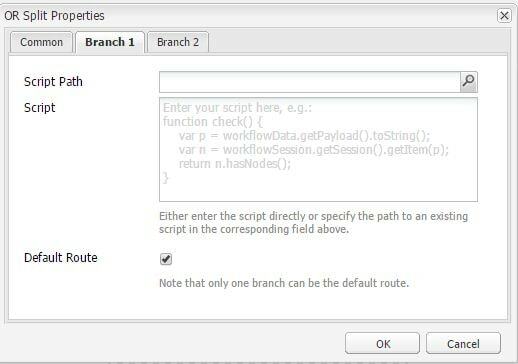 For Branch 2, ensure Default Route is not selected and Click OK.
You can provide a custom script in Script Text Area or create a ecma script under apps/<project>/workflow/scripts/ and enter the path in Script Path Text box. Process: Select Activate Page. This process publishes the selected page to the publisher instances. Check Handler Advance to auto move to Next Step. Click Save on Top Left. Note: Always click on Save other wise your changes won’t get reflected. Select Models tab –> Right click on Training workflow -> Click Start. Start Workflow window will open. Select Payload from content –> Click OK. Enter Workflow Title. Ex. Training Workflow. Click OK on Workflow Window. Go to Instances tab. Your training workflow instance will be listed here. 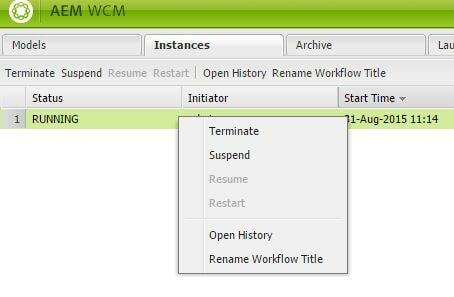 You can Terminate, Suspend or check status of workflow instance from here. You have successfully executed workflow in AEM. 7 Responses to "Steps to Create a Workflow in AEM"
It helps me a lot . Good article . you need to override getParticipant() function according to your requirement. 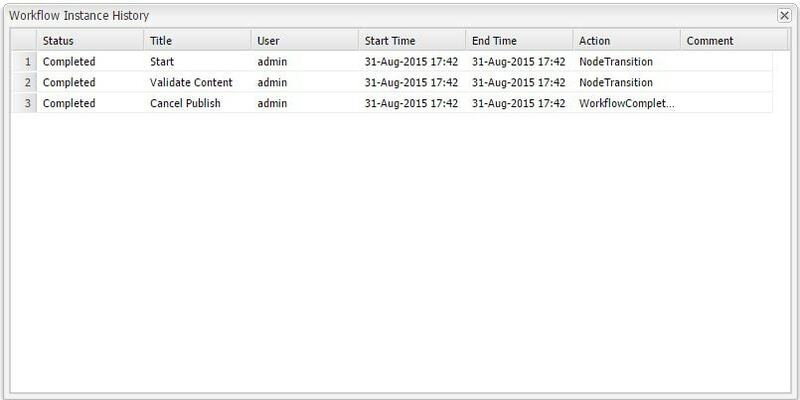 Currently it is returning workItem.getWorkflow() .getInitiator(). you can create a new ecma script and place it under /etc/workflow/scripts. 2. I need to submit that step again to remaining members in that group. 3.Once the 1st reveiwer rejected need to notify the initiator. Please help me achieve in EMAC scripts. I am very new to EMAC and workflows also. My scenario : I need to publish the page with all the contains like text, images in the when I click Publish ( I do not want to activate the image first and then publish the page ), my requirement is to publish the page automatically when click on publish and the new image should be published along with the page and it’s content (the image is uploads by image component or some other components). Can anyone guide me here, how to achieve this. I am new to the AEM could you please elaborate how aem flow works. with a demo example in step by step. As per above workflow, if steps move to publish the content, not go to cancel publish, what we need to do for this. Please suggest it. How to make a servlet call in a workflow process ? I am using dynamic participant steps in my workflow. There are 4 dynamic participant steps(author review/approve, publisher(review/approve)) before publishing the content. I have overridden getParticipant() method and assigned users groups (all are different) based on step (current node). Now if I want to step back from any of these dynamic participant step then how to find the target step and how to assign user groups because I am not getting the history items for the target step in getParticipant() at that point. Also is there any way to programmatically populate previous steps in step back dropdown in case of dynamic participant.